I found this poem after taking ten minutes of class to search through the 2008 volume of Best American Poetry. 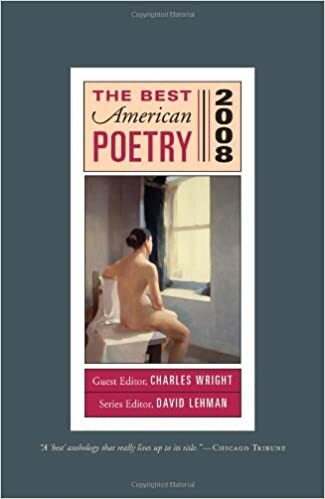 Originally, I was looking for a poem with a title I could relate to— “The Dead From Iraq” by David Young, “Snoring” by Mark Jarman, and even “The Water Cooler” by Paul Muldoon were among those. However, I should have know that you cannot judge a poem based on its title: I could not relate to the content. Finally, I came across a poem that both flowed beautifully and intrigued me as I read it. I read over it several times in order to truly feel the poet’s word-choice and decipher some of the vocabulary. I had to pull out my phone to look up a few words: teeming, awry, and elude. “Divide and Conquer” was my first time encountering a villanelle, “a nineteen-line poem with two rhymes throughout, consisting of five tercets and a quatrain, with the first and third lines of the opening tercet recurring alternately at the end of the other tercets and with both repeated at the close of the concluding quatrain.” Personally, I enjoyed it because of the rhyme throughout— a device many contemporary poets have started to avoid in their writings. While further researching the poem, I came across leukemia patients recording blogs for every day of their treatment, many of whom connected Sullivan’s poetry to their own circumstances. This is important because it shows that the poem has had an impact on peoples’ lives. One of the main reasons I chose to write about this poem was its focus on cancer, a pressing contemporary issue. Although millions of dollars are donated to research every year, cancer remains an issue that our generation and many more to come will have to continue to deal with. Though I personally have not lost anyone to cancer, its effect on the world is immense. I hope that one day a future generation will not have to worry about cancer.